For all who appreciate the fermented majesty. 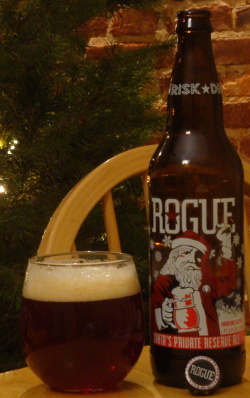 This evening I will have some of Santa’s Private Reserve Ale brewed by Rogue Ales out of Newport, Oregon. The bottle says cryptically “snowflakes glisten”, a hint at this bottle’s easter egg which you’ll discover if you drink it on a dark winter’s night. Santa’s Reserve is a red ale, a slightly beefier version of the Saint Rogue Red, which, incidentally, I’ve never really been a fan of. It pours a dark coppery red with a fair amount of tan head. Unfortunately the head is a bit swiss cheesy and doesn’t last very long. The aroma is rich with a strong hoppy character and a full maltiness. The hops come across as tropical fruit: pineapples and papaya with a hint of earthy pine, while the malt manifests as biscuits and toast. This beer is initially bitter, with a spruce and pine hop flavor. The bitterness fades a bit revealing just a bit of caramel sweetness, which itself yields again to the spruce hop flavor. This herbal hop character lingers on the tip of the tongue and the roof of the mouth. If there were a bit more alcohol warming it would balance quite nicely, but as it is the herbal bitterness is just a bit too strong. I quite like the nose on this one, but I’m afraid that the flavor doesn’t quite live up to the promise. Nevertheless, this is a drinkable winter warmer to enjoy on the cold, dark nights ahead. I picked up a bottle based purely on the style indication “French red ale”. I am hoping that this one is similar to Flemish red ales, one of my favorite kinds of beer. Red beers from Flanders are sour, aged in oak barrels which are infused with a cocktail of bacteria and yeast. The end result is a beer with a heck of a lot of character. 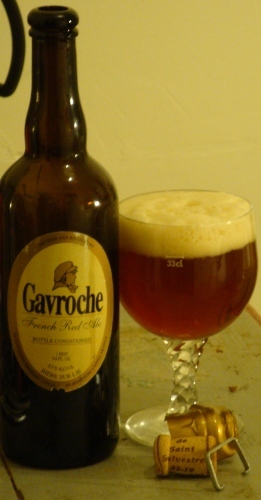 The French offering is called Gavroche, brewed by Brasserie St. Sylvestre in Saint-Sylvestre-Cappel. This hamlet, with just over a thousand residents, is in the far north of France, well within the sphere of influence of Flanders. 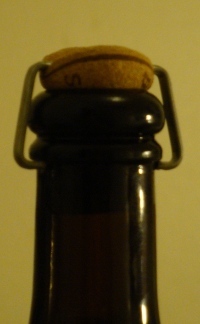 The bottle has easily the most interesting closure system I have seen in a while: it is corked with a mushrooming cork, like many Belgians, but instead of a thin wire cage to keep it in, there is one hefty wire bar across the top. I can tell from the nose that this beer isn’t sour, so I’m glad I’m trying it first. The Gavroche pours a beautiful orange-red, somewhere between copper and rust, clear enough to be brilliant, but with a satisfactory haze. The buff head is lusciously thick and creamy. The aroma is mild, dry and somewhat dusty. There is some toast and chestnut from the malt and a fair herbal and earthy hop character. The flavor is much more assertive than the aroma would indicate, largely due to the alcohol. A rich nuttiness from the malt blends well with an alcohol flavor suited to a port wine. Both of these are supported by a solid body, which the beer’s strong effervescence keeps refreshing. Caramel and toast malt flavors come through on the back, along with a strong herbal hop character. None of it lingers very long, or even long enough. The other red I will have tonight is brewed by Brouwerij Van Steenberge for the Monk’s Café in Philadelphia. This one is a sour, though Van Steenberge isn’t traditionally a sour beer house. The Monk’s Café is a wonderful ruby red, lightly hazy, with a little bit of an off-white head. The nose is definitely that of a Flemish red: strongly woody, with a significant balsamic vinegar aspect. A rich nuttiness and some sweetness linger in the background. The residual sugar is actually a bit more prominent than the organic acid. Caramel malt and some bread are followed by a balsamic vinegar flavor. Rather than evolving, like many examples, the depth of flavor somewhat falls away, leaving just a mouth puckering accompanied by residual sweetness. The mouth puckering doesn’t last long either, and the sweetness turns cloying. Over the next several days I will be tasting everything I can get my hands on from one of the most exciting new Iowa breweries, Peace Tree Brewing Company in Knoxville. They started making beer barely more than year ago, and hosted their grand opening just last March. However, as I understand it, they now produce as much beer as anyone else in the state. What has driven this explosive growth? The powerhouse team behind Peace Tree, Megan McKay Ziller, her husband Scott Ziller, and her father Daniel McKay have managed to hit a sweet spot that has enabled their continuous expansion. In my mind it is three specific factors. First, the beer. No brewery can have any measure of success without consistently producing drinkable and interesting beer. Peace Tree lured brewer Joe Kesteloot from the Cold Spring Brewery to capably tackle that side of things. This and the next few posts will certainly examine Peace Tree’s beers. Next, the marketing. The label and tap art is unique and interesting but also classy and consistent. The bottled beers come in those squat, round bottles you’d usually see holding a particular Jamaican beer (“hooray, beer!”), which makes them stand out just a little bit more. And above all, the team has done a great job of getting accounts in some important Iowa bars and retailers, making their beer highly available. I’ll talk more about this later. Lastly, it is authenticity. Peace Tree exudes honesty. 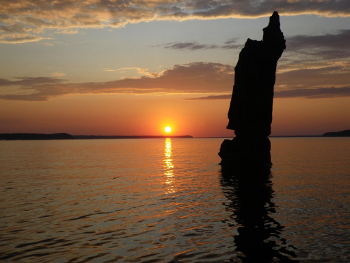 The brewery is named for the old stump that today juts out of the reservoir named (questionably) Lake Red Rock. Before the area was flooded, this tree served as a meeting point for Native Americans, and later fur traders. It is in that vein that tonight I taste two beers that are named for local landmarks. 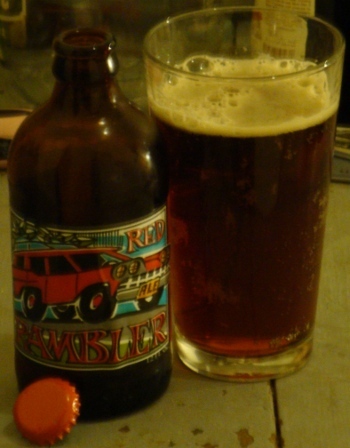 The Red Rambler is an homage to the building the Peace Tree brewery is in, which in a former life was a Nash Rambler dealership. After that I’ll have the Black River Gumbo Stout, named for the rich black gumbo soil of the Des Moines River. This brewery actually has a beer named for dirt. The Red Rambler pours mostly clear, a beautiful copper to ruby color, with some creamy off-white head. The nose is light but very intriguing. The malt is most prominent, with plenty of melanoidins making toast and caramel notes. In the background lie nut and raisin aromas, with a bit of a fruity hoppiness adding character. The flavor is very refreshing. The bitterness is immediately apparent – strong, but smooth. Rich malt flavors help bring it in balance, but this beer still leans towards hoppy. Herbal hops combine with bread and toast for a lively and interesting flavor. The body is present, but not full, and the carbonation light and creamy. The malt flavor lingers for a moment, the herbal hops just a moment longer. 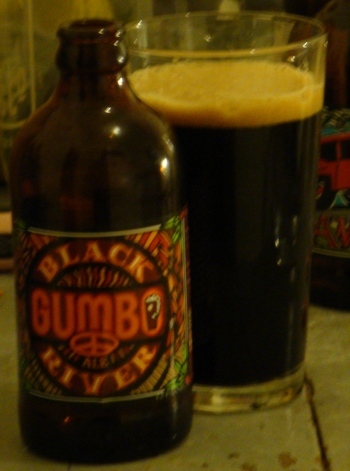 The Black River Gumbo Stout is, appropriately, a very dark beer, black to all but the brightest of lights. The ample creamy head is pale bronze color. The aroma is rich with roasted malts. A toasty, woody, even smoky character is offset by a rich and sweet nuttiness. Hazelnuts and walnuts are joined by plums before being overtaken by burnt bread. A deeply mesmerizing aroma. The flavor is certainly roasty, but much less oppressive than suggested by the aroma, coming off more like coffee and chocolate. Fruity character from the Belgian yeast makes for a lively balance. Thick caramel and roasted malt flavors do battle with the herbal hops and fruity yeast across the surface of your tongue. Eventually the malt wins out, leaving a caramel malt sweetness and roast malt bitterness lingering for a moment, not unlike a good coffee. All content © Andrew Couch.